"Arenaria Interpres" , winter visitor , passage migrant . 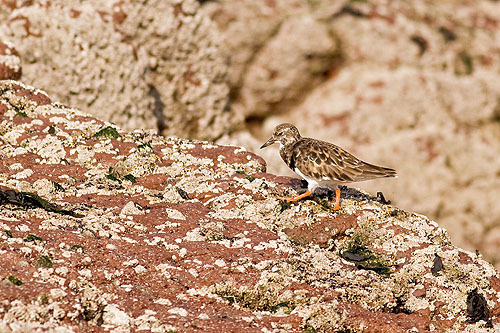 This short billed wader likes to stir up areas of stone , weed and debris , it will flip stones of almost its own body weight , to find insects , invertebrates . Nest is a scrape on ground , close to shore - islands and rocky coasts , 4 eggs , Incubation 22 days , Fledge 19 - 21days , 1Brood - May / July .